On 21 July 2018, Indian Men’s Hockey Team will take on New Zealand at 1600 hours IST. 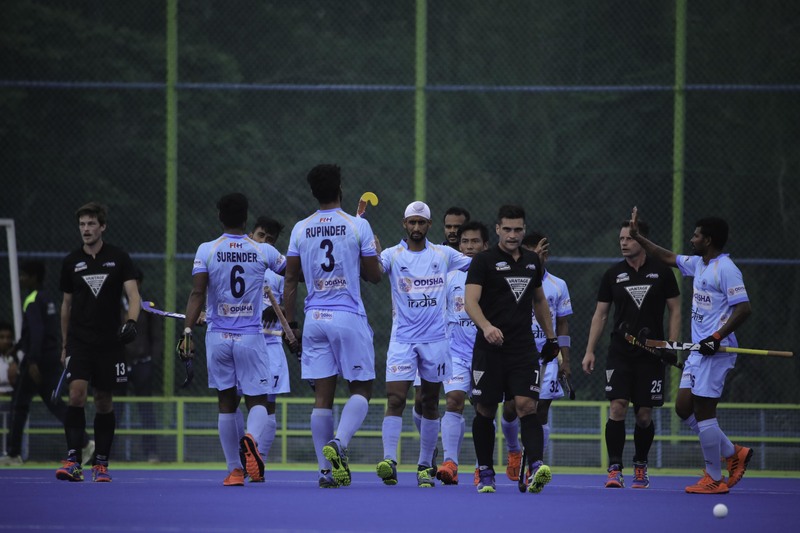 The Indian Men’s Hockey Team began their three-match Test Series against New Zealand with a sensational 4-2 win here at the Sports Authority of India, Bengaluru Campus on Thursday. Rupinder Pal Singh (2′, 34′), Mandeep Singh (15′) and Harmanpreet Singh (38′) scored in India’s win while Stephen Jenness (26′, 55′) scored a brace for the visitors. In the 15th minute, India doubled their lead to 2-0 when Manpreet Singh’s cross was brilliantly picked up by forward Mandeep Singh who swiftly deflected it into the goal. The second quarter saw New Zealand shake off the starting jitters and showed a tighter defence. Though India won the second PC of the match in the 22nd minute, a poor execution dented India’s chance of taking the score to 3-0. In the 26th minute, New Zealand finally made a breakthrough with Stephen Jenness scoring a perfect field goal that narrowed the lead to 1-2. After the half time break, India came back with a stronger attack. Forward SV Sunil, created India’s third PC. Drag-flicker Rupinder Pal Singh was brilliant yet again as he flicked towards top right of the net taking India’s lead to a comfortable 3-1 in the 34th minute. In the 38th minute, SV Sunil created yet another opportunity for India to score as he won another PC. Harmanpreet Singh was spot-on as he improvised the injection to powerfully convert India’s fourth goal. The final quarter saw New Zealand test Indian defenders as they made strong forays into the striking circle. Their efforts paid off with Stephen Jenness converting his second goal of the match as his shot bounced off Indian goalkeeper Suraj Karkera’s pad into the back of the net. With score-line reading 4-2, New Zealand won a crucial PC with four minutes remaining on the clock. But Nic Woods’ drag-flick was way off the target. The visitors earned yet another PC with a little over a minute remaining for the final hooter. And this time, Woods’ powerful flick was well defended by Karkera. New Zealand won two more back-to-back PCs with 50 seconds on the clock but Karkera was brilliant in his efforts to save and help India win the first match 4-2.